Reviews crime incident data at law enforcement agencies and colleges/universities in Middle Tennessee for accuracy and completeness. Prepares written reports after each review and must ensure all required steps are completed for each agency’s audit. May assist with audits of large agencies outside of the assigned region. Provides technical assistance to agencies/colleges with the reporting of crime incidents to TBI. Monitors data on a frequent basis using TN Crime Online to ensure agencies/colleges are contributing data according to state statute(s). Reviews take place on site and involve frequent overnight travel. Education and Experience: Graduation from an accredited college or university with a bachelor’s degree and one year of full-time experience within a criminal justice setting performing statistical analysis; examining criminal history and/or biometrics information; performing criminal justice information system (CJIS) program audits and/or training; or performing criminal justice communications work. Substitution of Experience for Education: Qualifying full-time experience within a criminal justice setting performing statistical analysis; examining criminal history and/or biometrics information; performing criminal justice information system (CJIS) program audits and/or training; or performing criminal justice communications work may be substituted for the required education on a year-for-year basis to a maximum of four years. 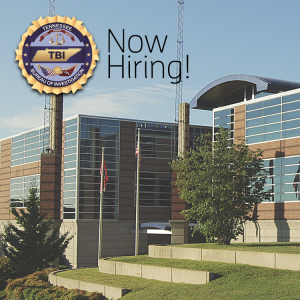 Apply for this position on requisition 162512 on the Tennessee Department of Human Resources website September 13-September 19, 2017 at http://www.tn.gov/dohr/employment/applicant.shtml. Positions will remain posted from September 13-September 19, 2017, for a total of five business days.